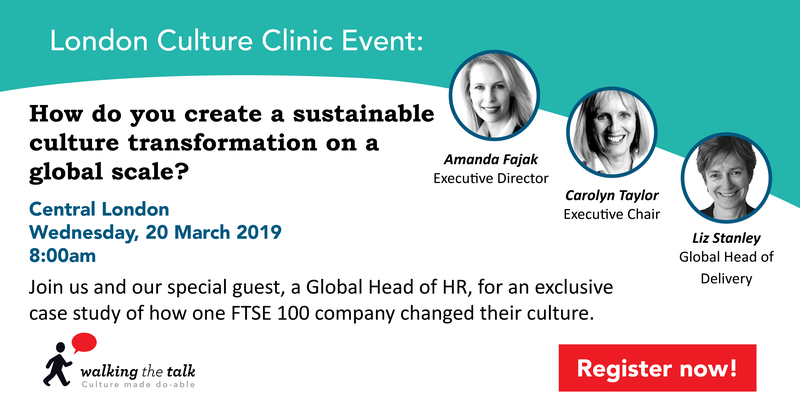 On March 20th we are delighted to be hosting one of our FTSE 100 clients to share their story of culture transformation. We would love you to join us for a thought-provoking session with an Executive Leader on how, with our help, they achieved culture transformation on a global scale. In the latest of Walking the Talk’s Culture Clinic series, we will be showcasing a case study of culture transformation achieved by a multinational leader in Pharmaceuticals, with over 40,000 employees around the world. By focusing on two very specific cultural goals over a a period of 18 months, this organisation was able to produce measurable behavioural change and link this to significant improvements in their business performance, including increased sales and reduced costs. Walking the Talk Founder, Carolyn Taylor, will be in discussion with the organisation’s Global Head of HR and will explore what it really takes to transform culture – the must dos, the tips and traps and what measurable success looks like.